LCR Tubes with less fun instructions inside. Zimmerman explains broken games as ones with no meaningful outcomes. Almost exactly the same conclusion I made, except I defined it as the player having no bearing on the outcome. No doubt I picked this idea up years ago from Sid Meier's idea of games being "a series of interesting choices". Zimmerman lists five broken game examples; War, Rock-Paper-Scissors, The Dice Game, The Number Guessing Game, and Matching Pennies. The assignment in his post is to create a variation on one of these games to fix the broken aspect. I'd like to do this assignment, but I'm going to choose a different broken game: LCR. Here are the original rules (as best I can recall). 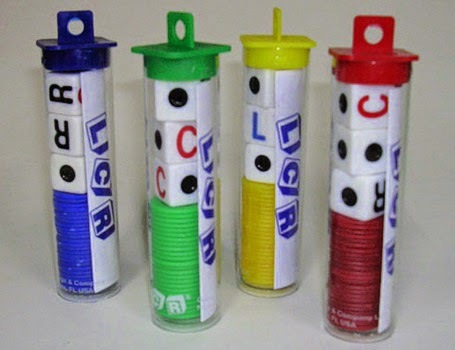 The game has 3 custom dice; half the sides are a dot, one side is an R, one is an L, and the final is C.
There must be 3 or more players (too many make for a long game too few is more boring). Each player starts with 3 tokens (or quarters to make the random win more exciting). On each players turn they rolls a die for each token they control, max 3. If a player controls no tokens, they are still in the game but cannot roll dice on their turn. The player will pass a token right for each R rolled, to the left for each L rolled, and put a token in the center for each C rolled. The final player to be the only one with tokens, wins (and gets the quarters in the center if playing with money). It's a simple game, and can even be fun. I think it's a party favorite because inebriated people don't have to make decisions. I've played this silly little game many times, and every time I can't help but think we're just waiting to find out what the random outcome will be (I'm rarely inebriated). Until I read Zimmerman's post, it never occurred to me to think about how I could change the game. Each player starts with 4 tokens (or quarters to make the random win more exciting). Before dice roll, the player will pass one token to the right or left. If a player rolls three dots, they take a token (if available) from the left or right player. I didn't change much. I felt it was important to use the same dice as the original game. Everyone will start with 4 tokens (now a nice round dollar if you're playing with quarters), and pass one before the roll. At the beginning of the game the choice is arbitrary. As it goes on though I hope this will make things more interesting. Will you pass to the player with more tokens than you, or to the player with none? Having the player pass before the roll makes players with only one token effectively out of the game, but still with a decision to make. The other decision making change is when a player rolls 3 dots, there is a 1 in 8 chance a player will roll this if they have 3 tokens (based on my experiences this is more common than you'd think). These two changes give players some deciding power on tokens going out and coming in. Unlike the real assignment I haven't been able to do any play testing (the number of people I know willing to play table top games is sad).